I love the holidays because I get to use special decorations I don't normally use the rest of the year. Each year I try to add a new piece to my collection to keep it fresh. This year I added this Holly, Berry, Pine Cone Centerpiece from Silk Plants Direct. 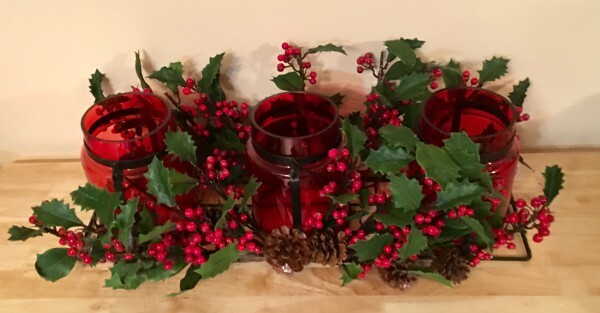 It's a beautiful arrangement of holly with berries and pine cones around three glass candle holders. It's all attached to a metal frame so you can easily pick it up and move it anywhere you like. It didn't come with candles, but I plan to use some of my LED candles inside so I don't ruin the beauty of the glass with wax. This centerpiece is 26" long so it's perfect for a mantel, coffee table, or the center of your dining room table when your entertaining guests. This beautiful centerpiece was provided by the good folks at CSI Wall Panels.